Hailing from the fertile heavy metal soil of Brazil is Sao Paulo's Armored Dawn. A mere two years ago they released their first album Power Of The Warrior to some acclaim. 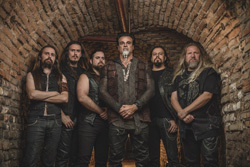 More importantly, the album opened the door for the band to play gigs with Symphony X, Rhapsody, Fates Warning, and Sabaton, giving the band even more visibility and credibility. Now they return with their second album Barbarians In Black for Germany's AFM Records. There's no mistaking Armored Dawn's sound: basic heavy power metal in the European tradition. Their songs work from the fundamental base of tradition "keep it true" heavy metal, add a hasty tempo for power metal, and then throw in some synths, mostly for symphonic embellish. To be fair, often the keyboards introduce a song, such as the piano line at the beginning of Beware of The Dragon or Unbreakable. Then there's the large synth orchestration at the front of Men Of Odin. Yet, after this, the synths are mostly muted in the arrangements, overwhelmed by the twin guitar riffage. The same could be said for Eduardo Parras' vocals. Though he sings clean, melodic, and strong, he can also sound muted in the mix as well. Another aspect to the vocals is Armored Dawn's consistent use of choral background vocals, notable in songs such as Beware The Dragon or Sail Away, something of a heavier metal ballad. But, essentially, the Armored Dawn song formula is rather predictable, perhaps even to the point of redundancy. Start with some synth opening (or straight riffage), move quickly to bombastic riffage and a galloping pace, and then make a bee line for the guitar solo (which are usually always epic in character). Repeat. It's a simple formula and it works well for Armored Dawn. If you dig bombastic, riff-roaring, power metal, and a lot of it, then by all means, get Barbarians In Black. 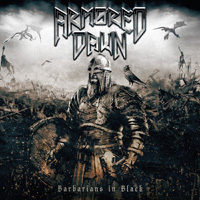 If you dig bombastic, riff-roaring, power metal, and a lot of it, then by all means, get Armored Dawn's Barbarians In Black.